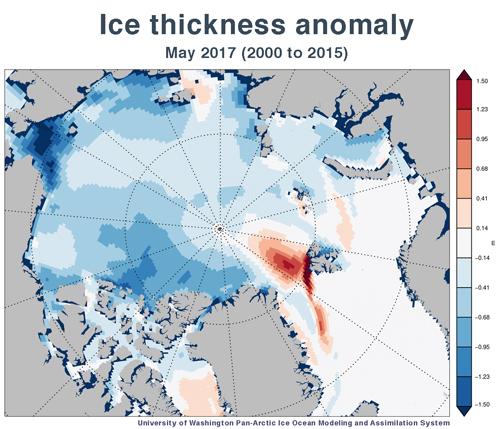 Monitoring by two Nasa satellites recorded 10,057 hotspots in Russia's Arctic territory by the start of August, 10 times more than were found in the same period a decade ago, according to data provided to The Telegraph. 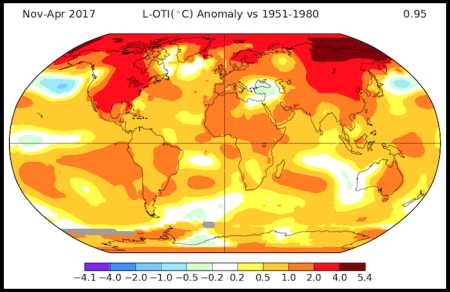 That number is the highest since the satellites recorded their first full year of images in 2003. 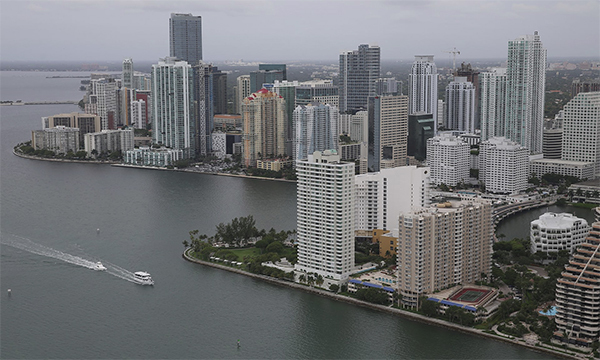 America's coastal cities are preparing for legal battles over real estate that slips into the ocean. One April morning in 2016, Daryl Carpenter, a charter boat captain out of Grand Isle, La., took some clients to catch redfish on a marsh pond that didn't use to exist. 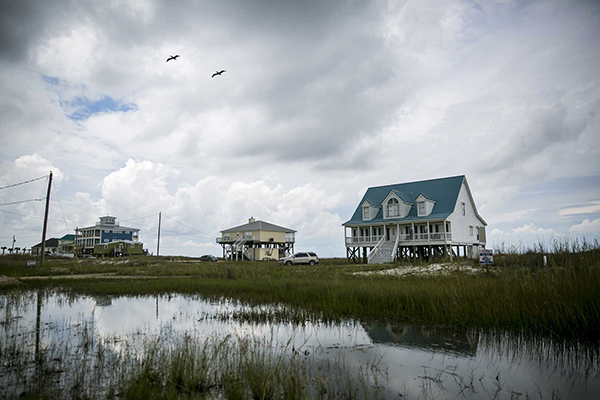 Coastal erosion and rising seas are submerging a football field's worth of Louisiana land every hour, creating and expanding ponds and lakes such as the one onto which Carpenter had piloted his 24-foot vessel. Suddenly, another boat pulled up beside Carpenter's. "You're trespassing," the other driver declared, before chasing him and his clients down the bayou. The sheriff's office later threatened to arrest Carpenter if he ever returned to the pond. There was just one problem: Under Louisiana state law, any waterways that are accessible by boat are supposed to be public property, argued Carpenter—even what was previously unnavigable swampland. 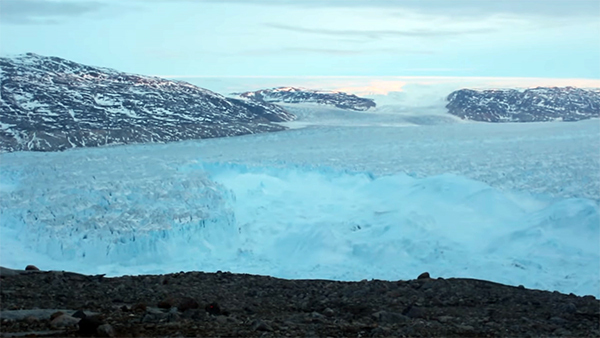 As climate scientists predicted, glaciers are vanishing due to rapidly warming temperatures. With global warming, we can make predictions and then take measurements to test those predictions. 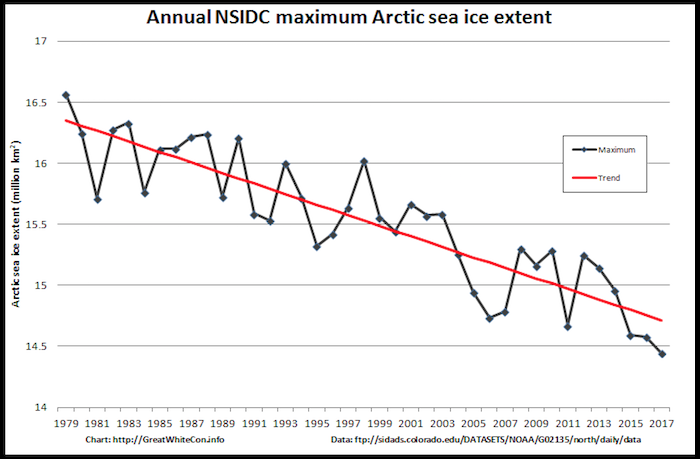 One prediction (a pretty obvious one) is that a warmer world will have less snow and ice. 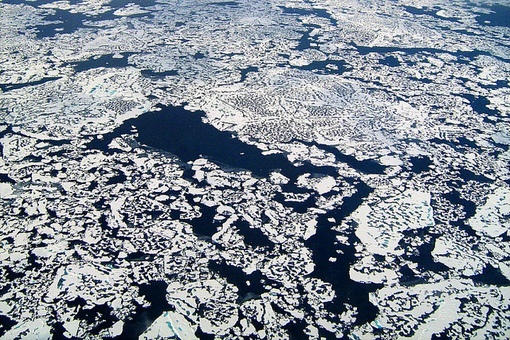 In particular, areas that have year-round ice and snow will start to melt. 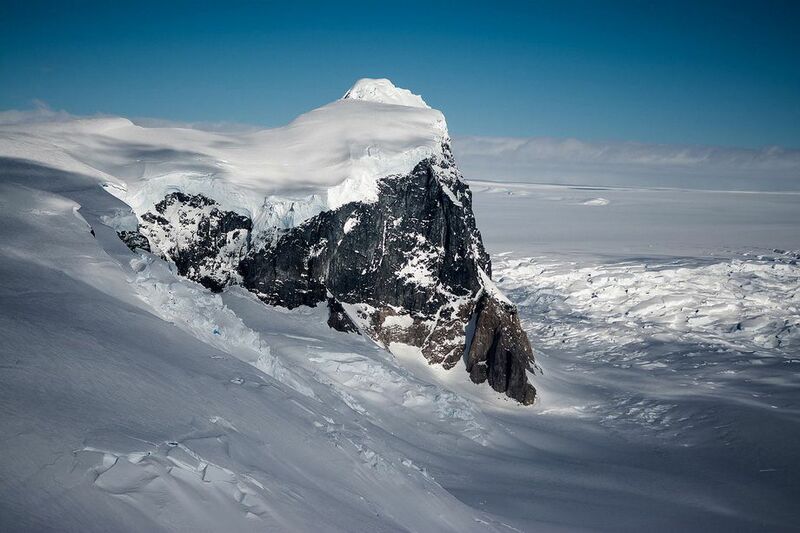 Alpine glaciers are large bodies of ice that can be formed high in mountains, typically in bowls called cirques. The ice slowly flows downwards, pulled by gravity, and is renewed in their upper regions. A sort of balance can occur where the loss of ice by melting or flowing at the bottom is equal to the gain of snow and ice by precipitation. 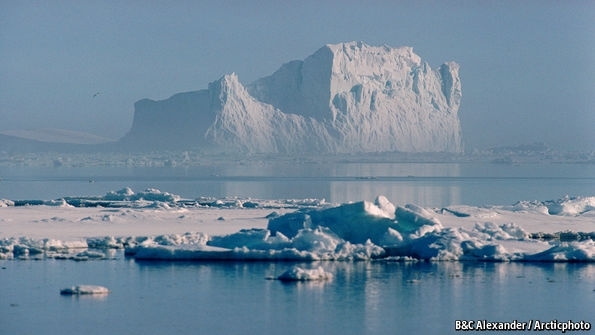 As the Earth warms, the melt line moves upwards so that the glacier melts faster and faster at the bottom, shortening the glacier and reducing its mass. Ultimately, the melted water flows into streams and rivers and ends up in the oceans, contributing to accelerating sea level rise. 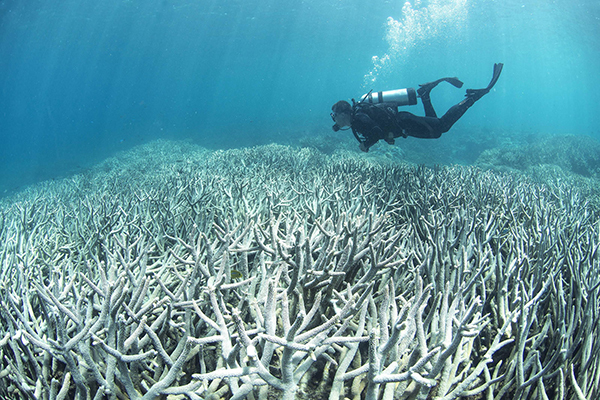 Scientists said nearly one-third of the reef’s coral were killed when ocean temperatures spiked in 2016, a result of global warming, according to a study published Wednesday in the journal Nature. 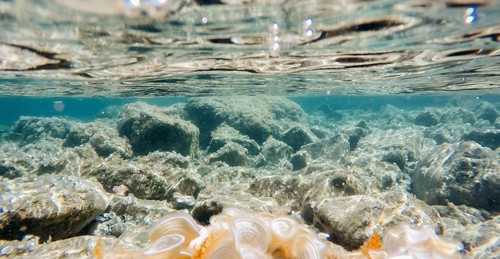 The damage to the reef, one of the world’s largest living structures, has also radically altered the mix of its coral species, scientists said. 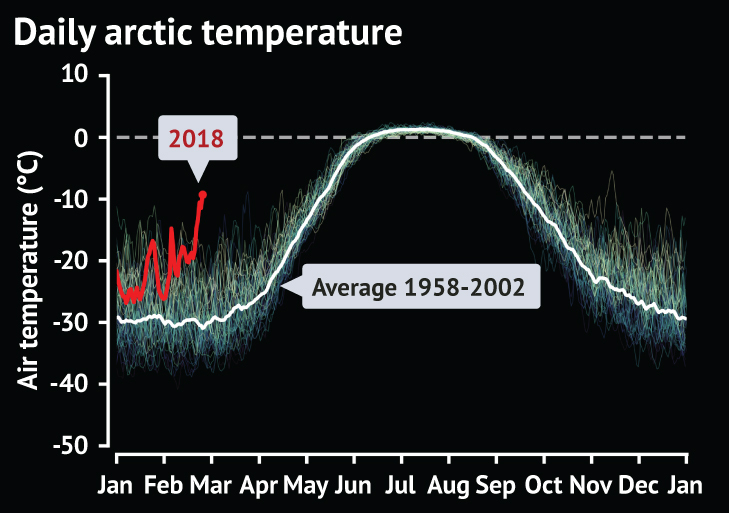 "To have zero degrees at the North Pole in February – it's just wrong," said Amelie Meyer, a researcher of ice-ocean interactions with the Norwegian Polar Institute. "It's quite worrying." The so-called Polar Vortex – a zone of persistient low-pressure that typically keeps high-latitude cold air separate from regions further south – has been weakening for decades. Shifts in climate can be exponential, abrupt and massive due to “feedbacks,” which can amplify and diminish the effects of global warming. A “warning to humanity” raising the spectre “of potentially catastrophic climate change… from burning fossil fuels, deforestation and agricultural production – particularly from farming ruminants for meat consumption,” was published in the journal BioScience last week. 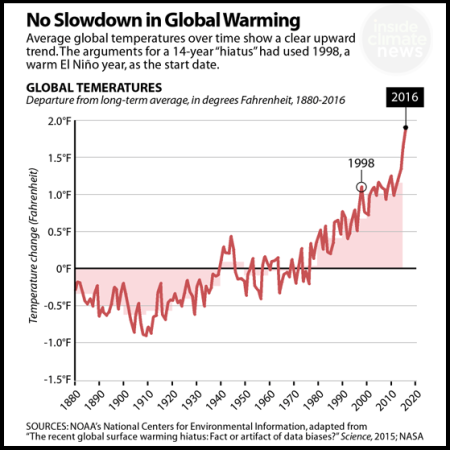 The just issued warning from the science community in the article below may seem dire, but in fact, the warning falls far short of reality. Issues like the ozone layer collapse are completely glossed over in this new warning which simply pushes the official lie that the ozone layer is recovering (which, again, is patently false). The worsening ozone layer collapse alone has the potential to cause planetary omnicide in the next decade (or less) and that factor is not even considered in the warning from the scientists. Our collective reality will not be the same for much longer, collapse on many fronts is imminent and now very close. We are already well into the curve of the 6th mass extinction on our planet, is there any chance of salvaging what is yet left of Earth’s life support systems? Perhaps that depends on that actions we collectively take, or don’t. Time is not on our side, as the biosphere collapse becomes impossible to hide, the power structure will become more desperate and dangerous than ever. We must all do our part to sound the alarm, life on Earth is in the balance. The Western US has, at minimum, long since become a climate sacrifice zone for the geoengineers. The current NOAA departure from normal high temperature "forecast" map is below. This map reflects nothing less than the "scheduled" weather from primary climate engineering contractor, Raytheon, who does all the forecast modeling for the National Weather Service (NWS) and the National Oceanic and Atmospheric Administration (NOAA). 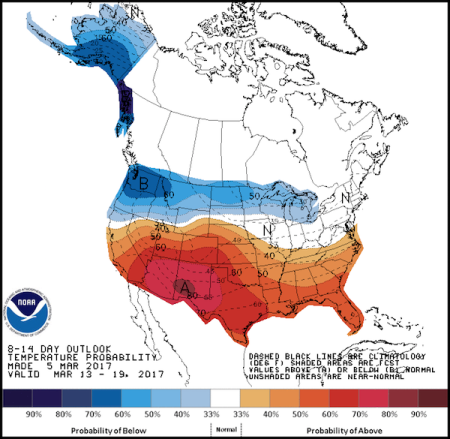 In this completely engineered scenario, ionosphere heater induced record shattering heat will bake the Western US while potential record cool temperatures may occur in the Central US. 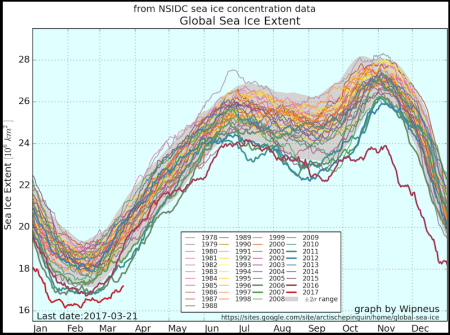 The scenario shown below has been repeated by the climate engineers countless times since 2007. 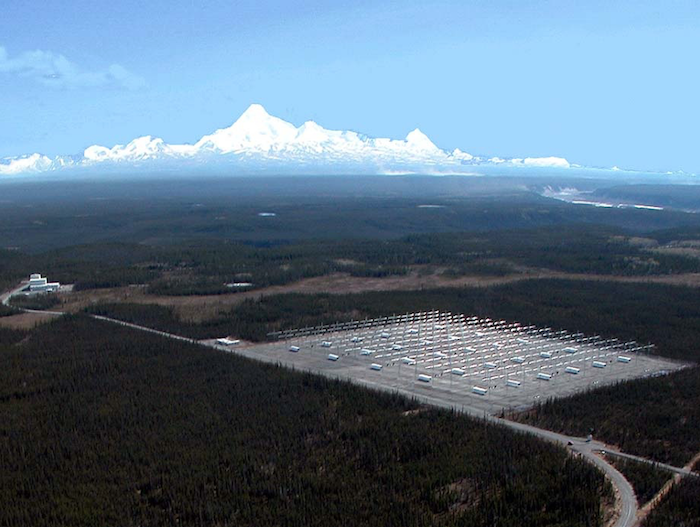 The HAARP ionosphere heater installation in Alaska is only one of many large radio frequency / microwave transmitters located around the world that are utilized for climate engineering purposes. 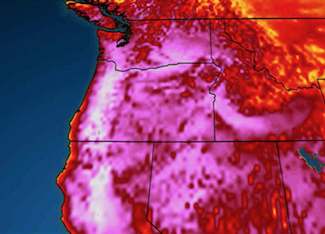 Though the "official" forecasted record highs in the West are alarming enough, the actual temperature readings on the ground are now significantly higher than the "official" readings in almost all locations monitored by GeoengineeringWatch.org and others. The latest "Temperature Departure From Average" map shown below is very revealing in regard to the true state of global temperatures. Where is it cool? Where not? 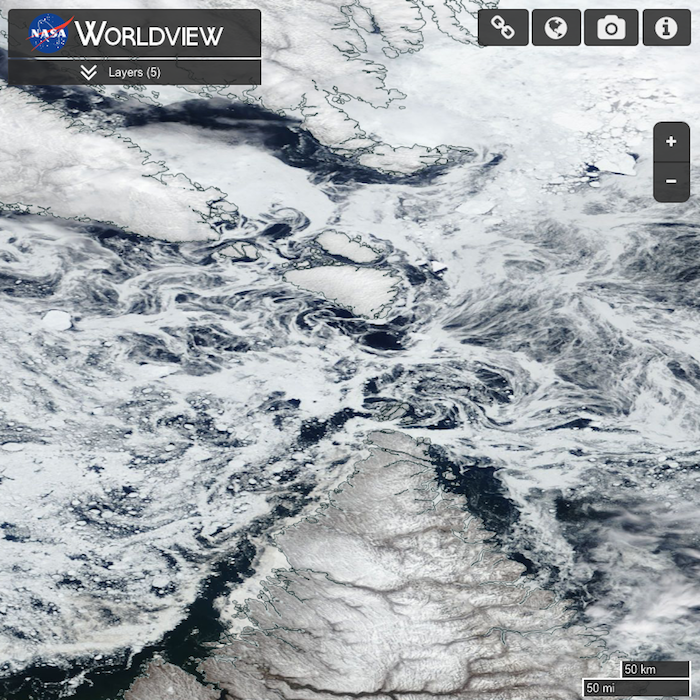 The coming climate engineering cool-down in the eastern two thirds of the North American continent truly stands out. Antarctica also stands out as a focus of the global climate engineering assault, a primary element of which involves chemical ice nucleation for weather modification. 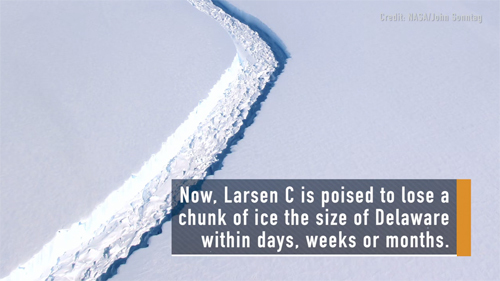 Due to the recent collapse of the immense Larsen C ice shelf in Antarctica, the climate engineers appear to be fully engaged in an increasingly desperate and destructive attempt at damage control in the polar regions. The increasingly radical swings in Greenland melt extent is another glaring red flag in regard to the on and off engineered cool-downs which include chemical ice nucleation as a major factor. 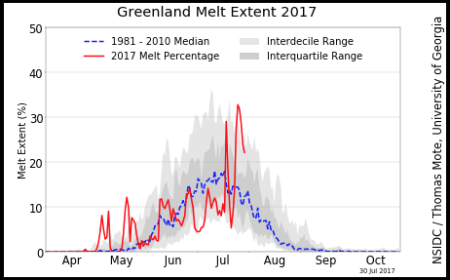 The extreme fluctuations in the Greenland surface melt graph below are alarming and indicative of the ongoing climate engineering assaults in the region. 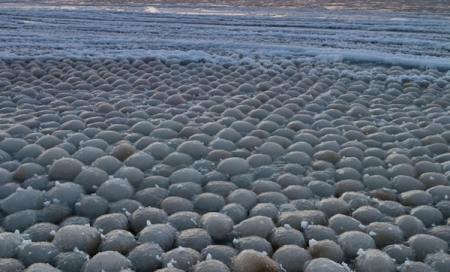 Sea surface chemical ice nucleation processes are also being utilized on a massive scale. 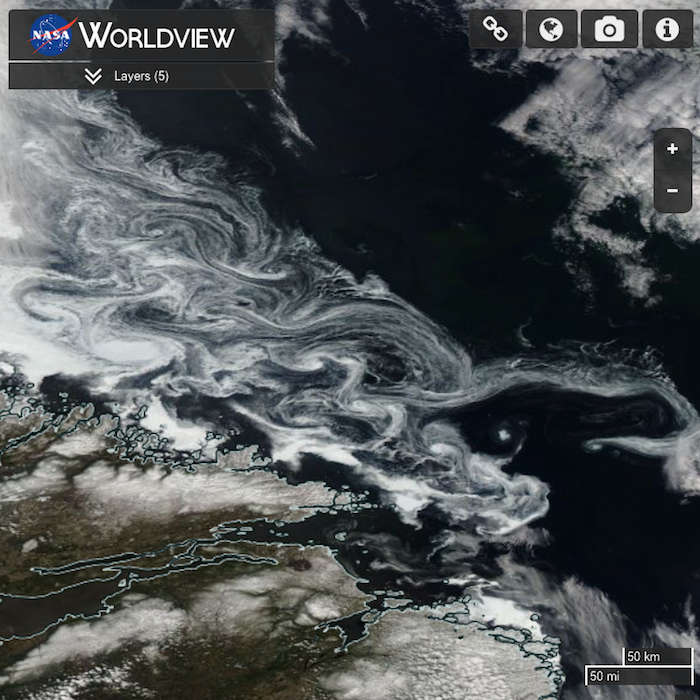 The swirling patterns left from chemical ice nucleation materials on the sea surface are very clearly visible in the NASA satellite image below (east coast of Greenland). 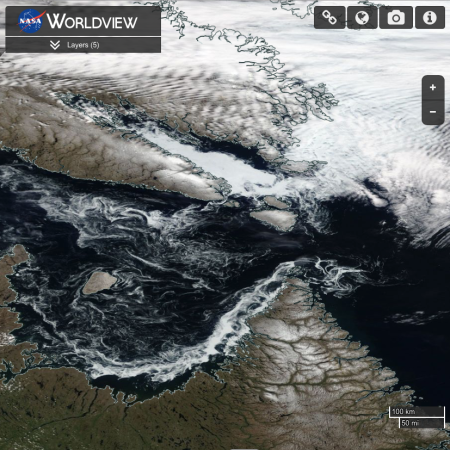 Such patterns are also clearly different from the usual broken ice mosaic seen in the upper right of the satellite image. 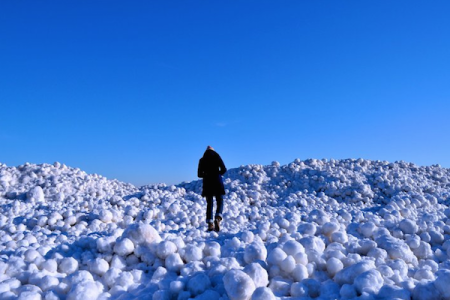 The power of chemical ice nucleation elements must be seen to be believed, the lab test shown in the 15 second video below gives a glimpse. 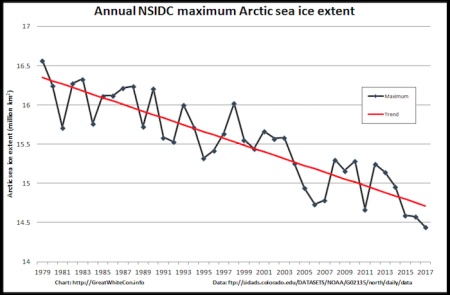 Arctic ice mass (volume) has dropped precipitously in recent decades and is now at dangerously low levels. In the attempt to hide this fact from the public for as long as possible, the climate engineers have decimated the planet and the atmosphere as a whole. 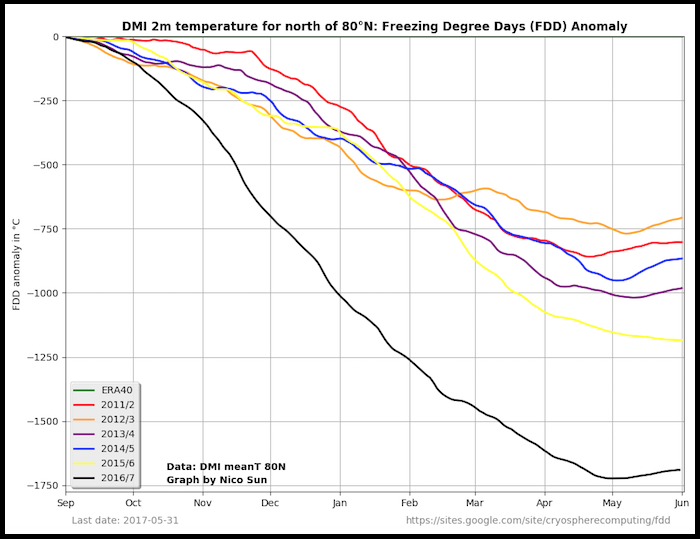 The very short animation in the video below is even more revealing in regard to the true state of the Arctic ice volume implosion. 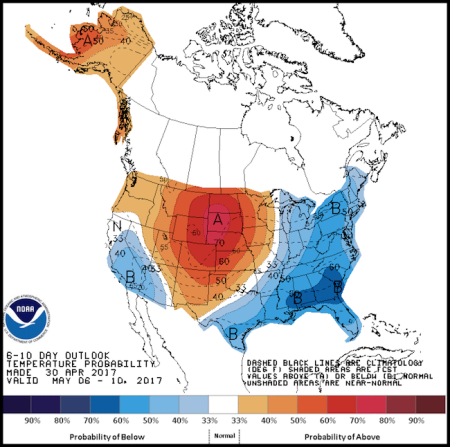 Where are the US temperatures predicted (scheduled) to go in the coming months? 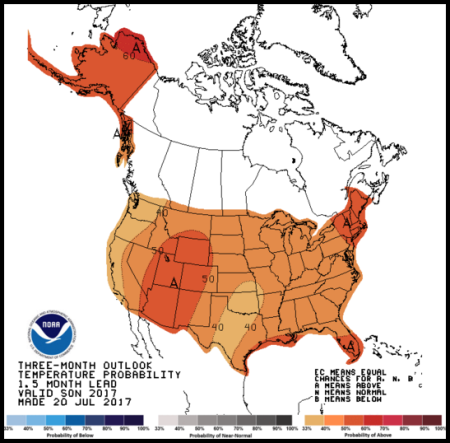 The NOAA long term forecast map below reveal the accelerating warming that will soon become impossible to deny for even the most willfully blind. 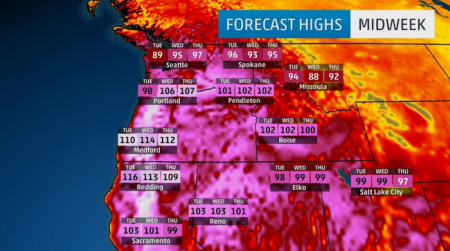 Again, the record heat / record cool weather whiplash scenarios (that has now become the norm in the US and the world) is completely engineered, completely unnatural, and until the recent past, meteorologically unprecedented. Why would the climate engineers carry out such scenarios? Because engineered cool-downs (like the one currently slated for the eastern two thirds of the country) continue to fuel the division and confusion in the population as to the true extent of damage to the climate system (which global geoengineering is making exponentially worse overall while simultaniously destroying the ozone layer). 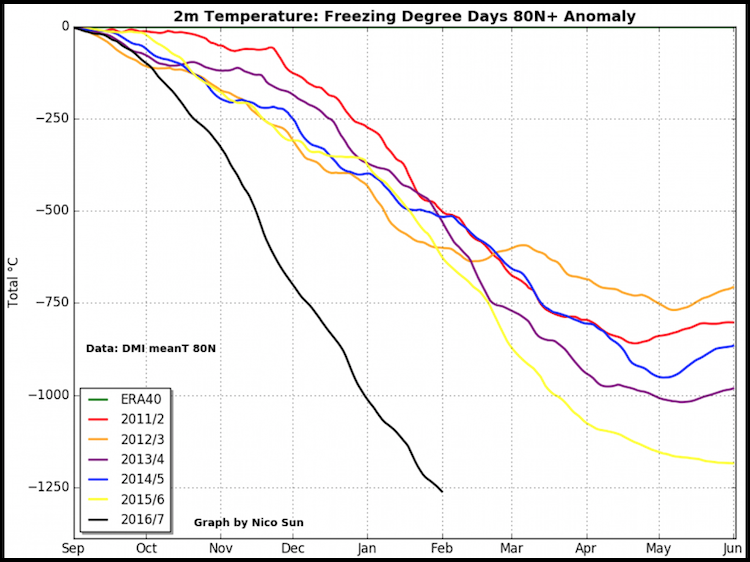 The climate engineering manipulated cool-downs are, of course, only temporary. They are also highly toxic due to the geoengineering jet dispersion of chemical, heavy metal particulates and polymer fibers. Just as there can be no legitimate discussion of the state of the climate without first and foremost addressing the global climate engineering assault, there can also be no legitimate discussion of climate engineering without addressing the constant engineered cool-downs and the chemical ice nucleation factor. Chemical ice nucleation is a primary element in the ongoing climate engineering assault. If climate engineering is to be effectively exposed and halted, this critical aspect of the equation must be understood and addressed. While the majority of the masses are still allowing themselves to be distracted with power structure orchestrated political theater, the biosphere is collapsing and every breath we take is being contaminated with the toxic fallout from the climate engineering operations. How long till the power structure plays the WWlll card as a final option? What are your priorities? Make your voice heard in the critical battle to expose and halt the global climate engineering / weather warfare assault, and for the greater good. 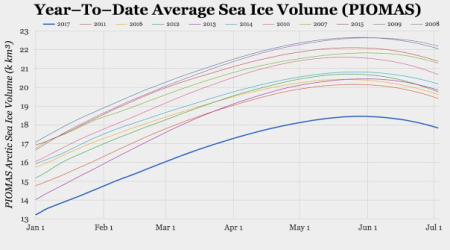 Under frigid winter conditions, the Arctic’s floating lid of sea ice typically expands to a maximum extent in March. 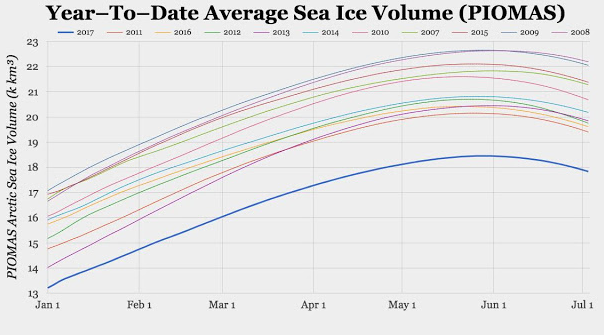 But thanks to human-caused global warming, that maximum seasonal spread of the ice has been shrinking over the years — and this past March it reached the lowest level ever observed for the month. ROME, Jun 23 2017 (IPS) – Record high temperatures are gripping much of the globe and more hot weather are to come. 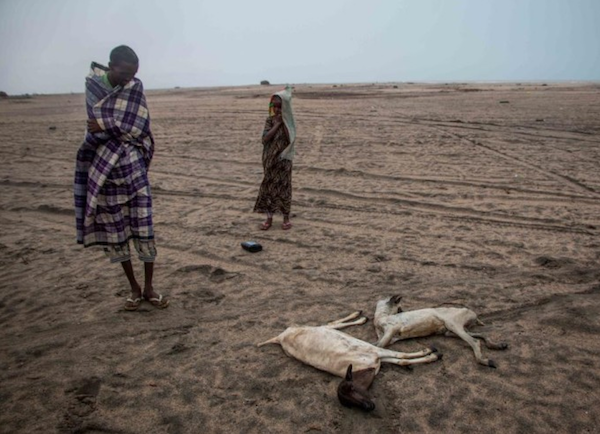 This implies more drought, more food insecurity, more famine and more massive human displacements. 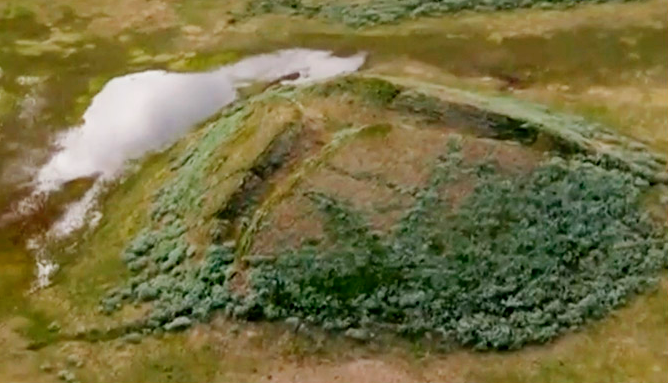 “DUE to the global warming, please keep the Snowhotel door closed” reads a sign at the entrance to what appears to be a giant white mound near Kirkenes, close to Norway’s Arctic border with Russia. The owners want to preserve the frozen friezes of unicorns, reindeer and butterflies that adorn its walls. Patches of translucence in the ceilings of the hotel’s 25 icy rooms suggest the warmth outside is winning. Artificial snow helps build the structure anew each November and it usually disappears before May. The season has shortened in recent years, says one employee; the cold comes later than before. The Snowhotel’s lengthening off-season is a small sign of an immense transformation in the Arctic, where the environment is changing more rapidly than in the rest of the world. 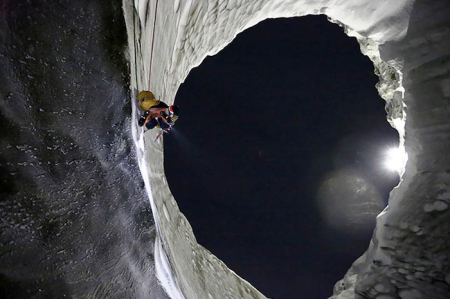 Little can be done to keep its white wastes intact. 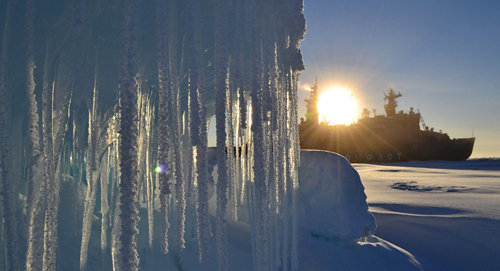 A great thaw is inevitable as the climate responds to an accumulation of carbon emissions in the atmosphere. 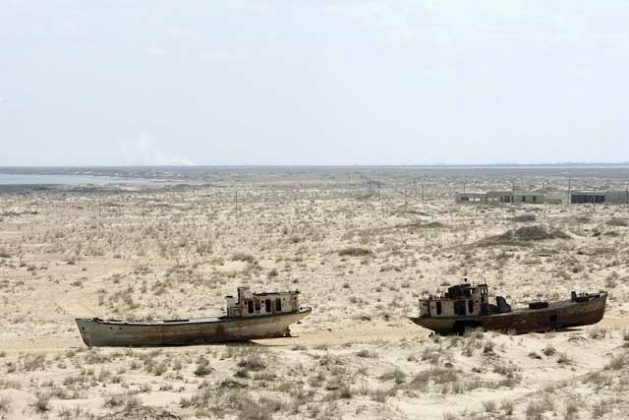 International efforts to limit global warming will at best slow the changes, perhaps making the consequences merely terrible rather than catastrophic. For many decades a covert global collaboration of governments has participated in the complete manipulation / disruption of the planet's weather and climate systems. There are many agendas being carried out in our skies by these global powers, none of these agendas are benevolant. The degree to which the weather-makers can manipulate precipitation is difficult to fully comprehend, the effect on populations and the planet has been devastating. 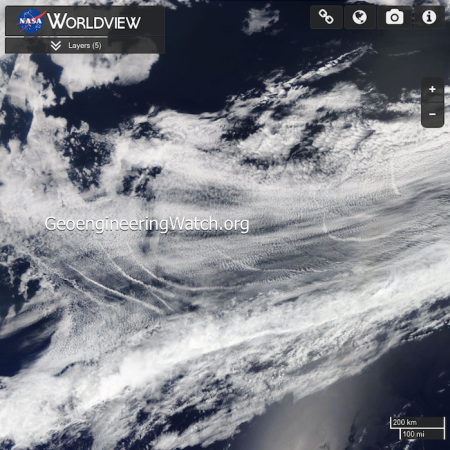 The NASA satellite image below reveals extreme aerosol spraying operations being carried out in the Eastern Pacific over major flows of atmospheric moisture migrating toward the West Coast of the US. A large component of the jet aircraft sprayed aerosols are electrically conductive heavy metals like aluminum and barium. These elements assist the weather makers with their constant manipulation of precipitation events. 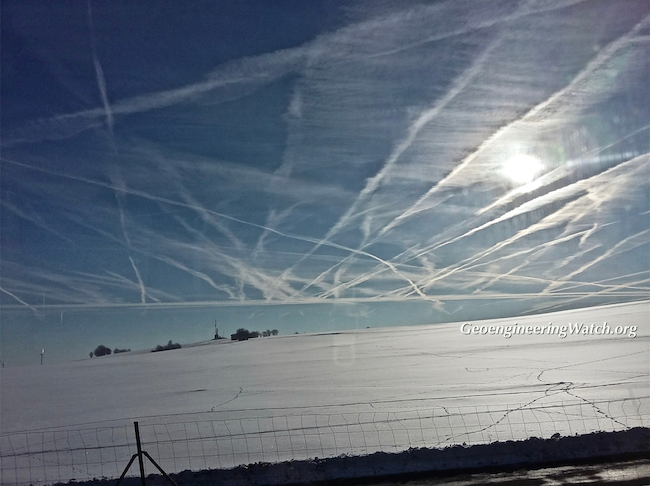 Extremely powerful radio frequency / microwave transmissions are another primary means by which the weather makers manipulate heavily aerosolized flows of precipitation. 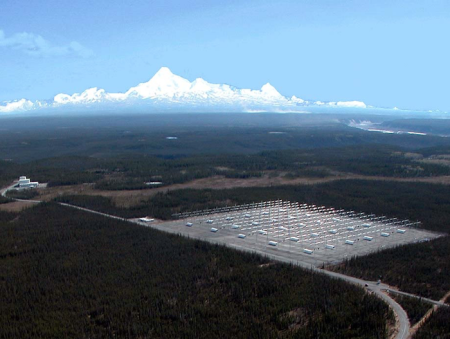 The very revealing animation below clearly illustrates the effects from a powerful radio frequency / microwave transmitter near Beale Air Force Base, California. By these methods those in power can effectively migrate rain over some regions and allow it to come down elsewhere, often in the form of a highly destructive deluge. 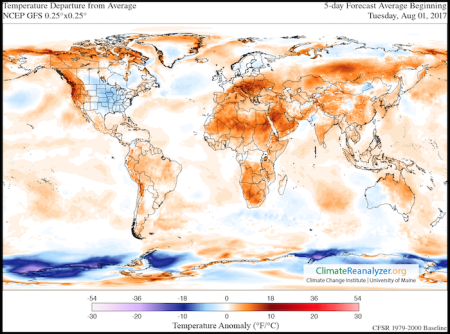 The climate engineers decide where it rains, and where it does not. They decide how toxic the rain will be, or if a zone will be temporarily cooled down by chemical ice nucleation processes. 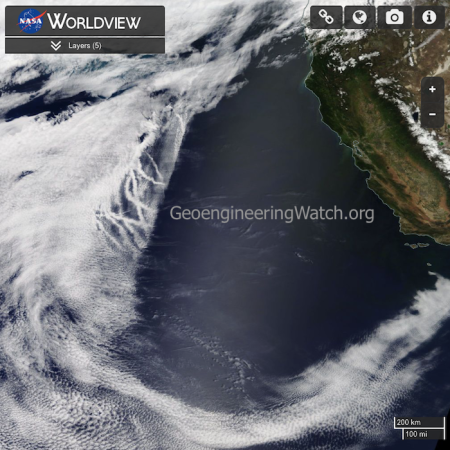 From drought to record flooding deluges, the geoengineers are the ones pulling the levers. 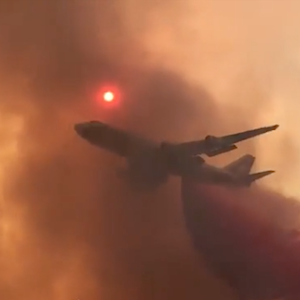 In addition to the climate intervention insanity, it is important to also remember and consider the countless other forms of anthropogenic damage to the climate system and the planet as a whole. Large incoming cells of precipitation are completely dispersed by the Beale transmitter with none of the migrating rain actually precipitating past the transmitter site. This next NASA image is a shockingly clear illustration of the climate engineering process already addressed in this article. A massive cloud formation off of the US West Coast has blatantly obvious signs of heavy aerosol spraying. This formation also has extremely unnatural borders due to radio frequency / microwave transmission manipulation. 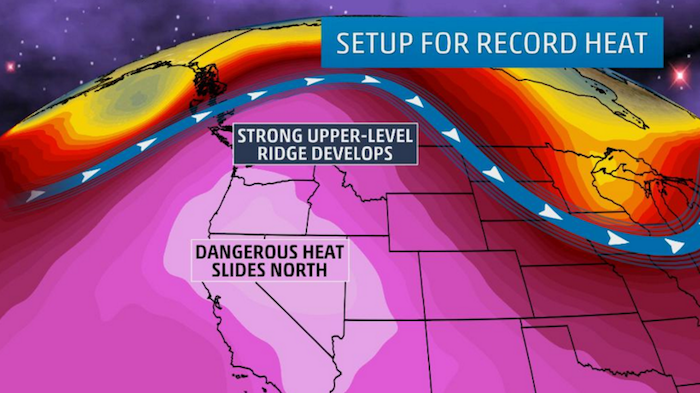 The image above was captured as a massive high pressure dome was being set up over the US West Coast. This rain blocking heat producing scenario (termed the "ridiculously resilient ridge") was a primary causal factor in the record shattering California drought. 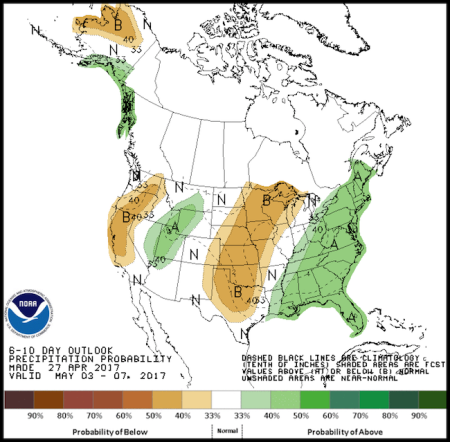 Though much of California has been allowed to receive substantial rains this year, devastating drought could be put back in place by the climate engineers at any time. The NOAA precipitation "forecast" (scheduled weather) map below is the latest example of the now unprecedented precipitation patterns. 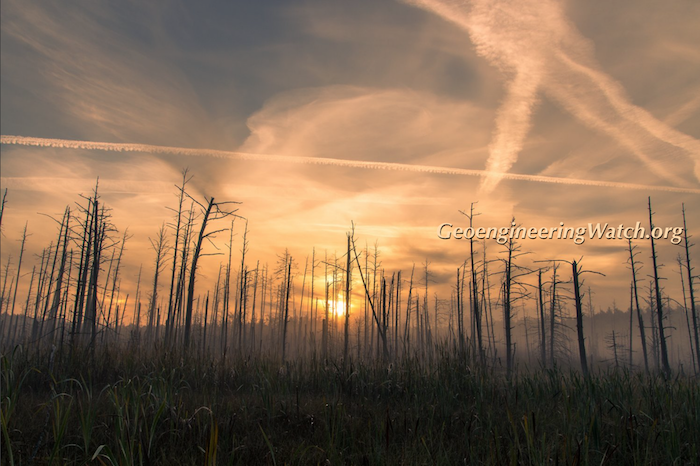 Geoengineering is completely disrupting the global hydrological cycle. 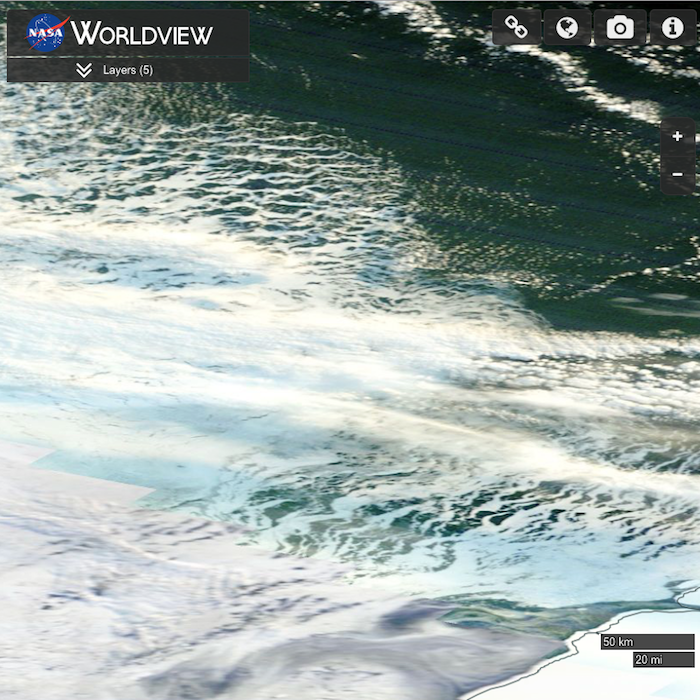 A primary purpose of precipitation dispersion / migration / manipulation is to create largest possible expanse of cloud cover / haze, and to keep the moisture aloft and available for creating precipitation events and/or chemical ice nucleated cool-downs. Extreme weather whiplash scenarios are increasingly the norm as the desperation of the climate engineers continues to manifest. 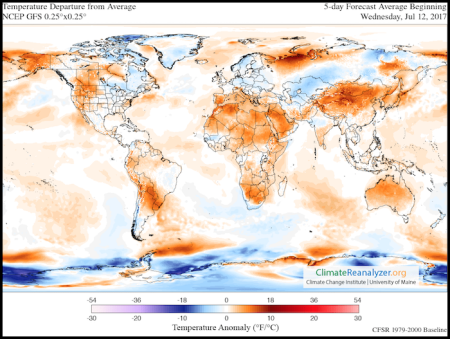 Meteorologically unprecedented and completely engineered hot and cold zones now blot global temperature maps. Every engineered (and highly toxic) chemical cool-down event that the geoengineers carry out comes at the cost of an even worse overall warming of the planet. It comes at the cost of an even more damaged ozone layer and an even more contaminated biosphere. The human race has inflicted countless forms of damage to our once thriving planet (with the ongoing geoengineering insanity at the top of the list). How much more can the planet take before complete biosphere implosion? If we remain on the current course, we will very soon find out. Every single one of us is needed to help sound the alarm, make your voice heard. Its true that not all the sea ice is gone yet, but much of what remains is thin enough that the light passing through it is allowing algae blooms. In many places it is cracked and subject to being broken up by storms which due to the extremes of heat and cold confronting each other in that region have extremes of wind and wave. 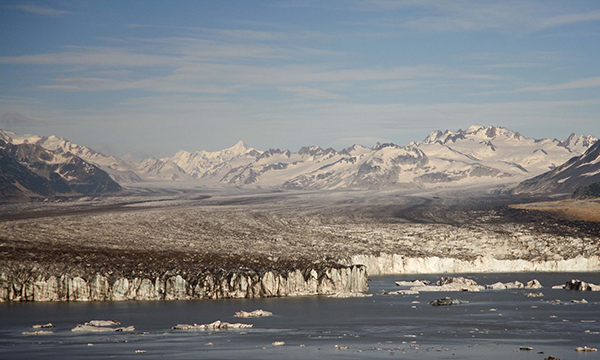 The Jacobshaven Glacier delivering 10% of the ice melt from Greenlands ice caps to the sea no longer flows at a glacial pace but rather is retreating at 10 km/yr with the rate of retreat increasing at an increasing rate just as with the sea ice. Massive methane eruptions are pushing the planet toward Venus Syndrome. 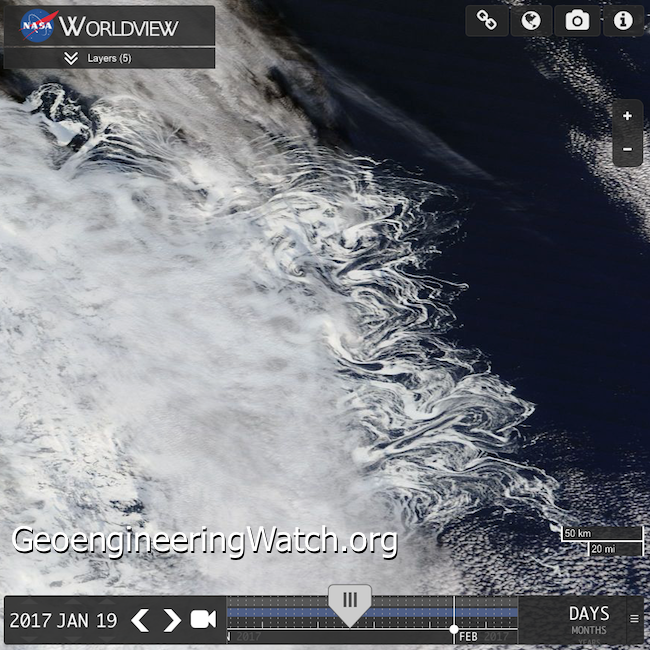 The climate engineering cabal is completely committed to chemically ice nucleating the polar regions in an unimaginably desperate and destructive attempt to cover up the unfolding methane catastrophe. 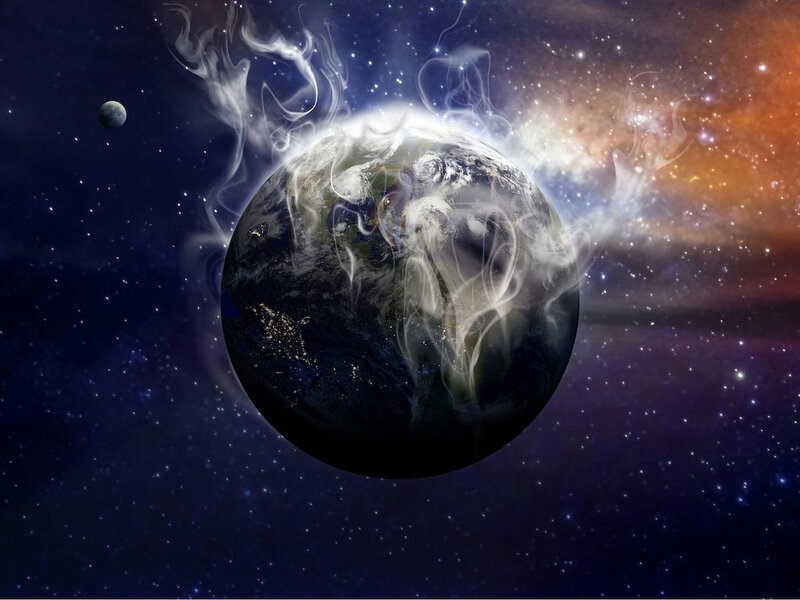 For well over 70 years global powers have been consistently ramping up covert climate engineering programs that have now all but completely derailed the planet's life support systems. Without the knowledge or consent of their populations, governments around the world colluded and collaborated on the organization and deployment of incredibly destructive climate "intervention" programs that are further fueling the catastrophic consequences of anthropogenic activity on planet Earth. 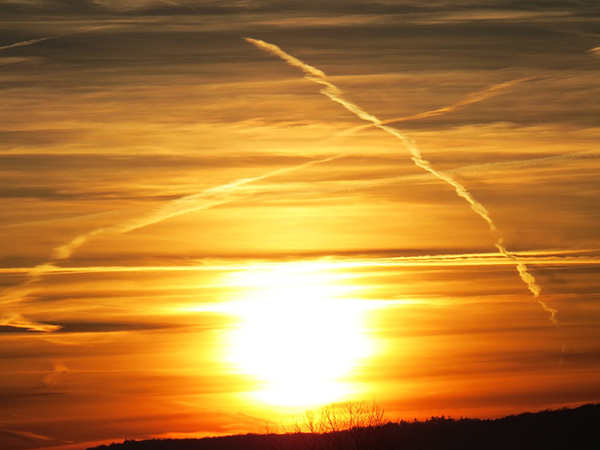 Of all the forms of decimation the human race has inflicted on our formerly thriving biosphere, the ongoing geoengineering assault is mathematically the most ominous and destructive. Earth's climate during the past 10,000 years has likely been the most stable in the history of our planet. The miraculous energy balance, previously maintained by our atmosphere, has now been completely destroyed. In an unimaginably desperate and insane attempt to hide the extent of biosphere damage (due to countless forms or human activity including climate engineering) from unsuspecting populations for as long as possible, the global power structure may have sealed our fate. Climate engineering/intervention programs are NOT about the common good in any way, shape, or form. Rather, such hubris is about power and control, period. 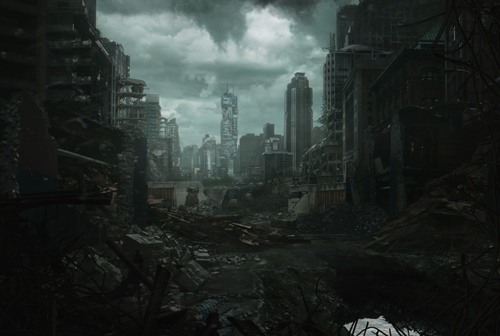 The planet is now reacting and responding to the damage done, the signs are ominous. 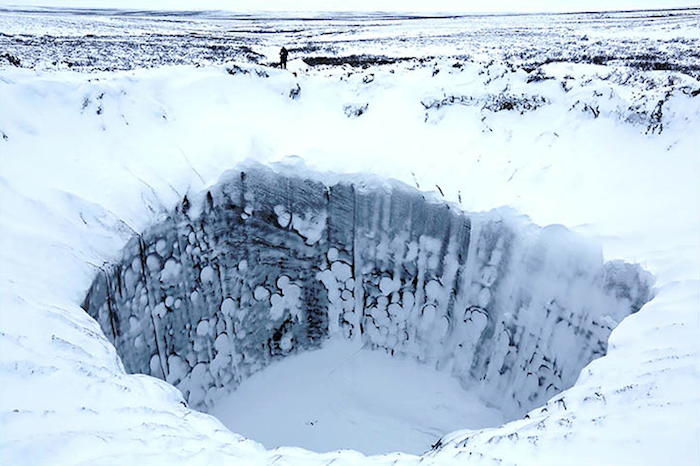 Scientists have discovered as many as 7,000 gas-filled "bubbles" expected to explode in Arctic regions of Siberia after an exercise involving field expeditions and satellite surveillance, TASS reported. Like giant blisters on Siberian landscape, countless bulges are being pushed up from the explosive force of rapidly thawing methane deposits in the permafrost. 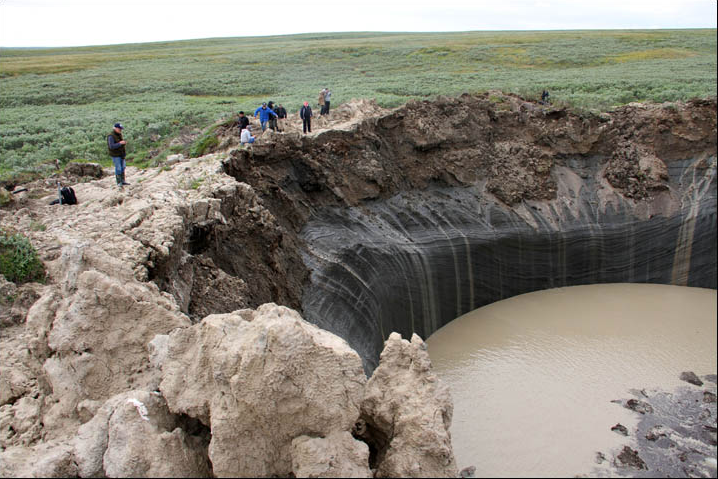 Photo credit: The Siberian Times"
When enough pressure is built up from the heating and expanding methane, an eruption of immense force occurs. 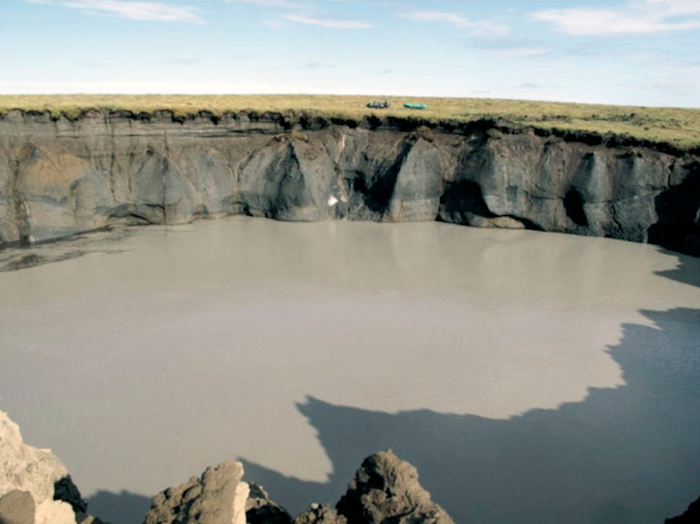 The methane craters are alarming harbingers of immense planetary change. Trump' Defense Secretary Cites Climate Change as National Security "Challenge"
The World Meteorological Organization (WMO) warned Tuesday that the drastic shifts seen in the global climate system that resulted in a range of alarming records last year appear to be continuing unabated. "We are now in truly unchartered territory," David Carlson, head of the World Climate Research Programme, said in a release from the WMO. 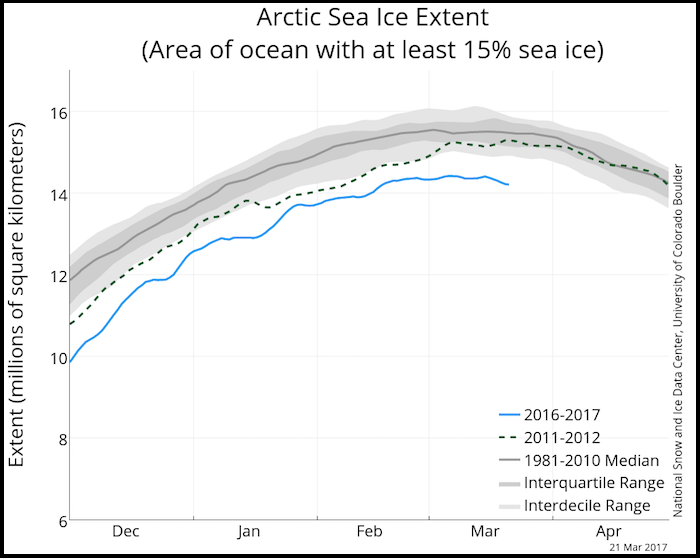 Arctic sea ice has just set yet another record low, breaking the former record low level set last year. 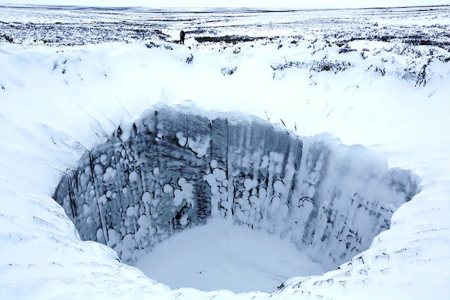 The power structure and the geoengineers who serve it are increasingly desperate to mask the unfolding Arctic cataclysm. Why? To avoid panicking populations in order to maintain the current paradigm (and thus their stranglehold on power) till the last possible moment. Does this mean climate engineering is somehow for the greater good? Such a notion could not be further from the truth. Climate engineering programs are actually fueling the overall global meltdown while poisoning the entire planet in the process. The recent NASA satellite images shown below reveal astoundingly anomalous sea surface ice formation patterns taking place in various regions of the Arctic (in spite of record high ocean temperatures). 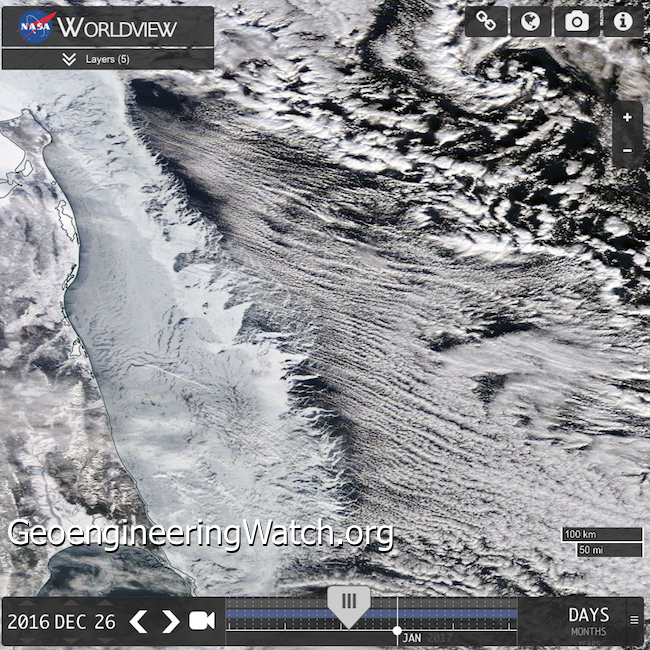 The anomalous ice formations are the result of climate engineering and chemical ice nucleating materials. 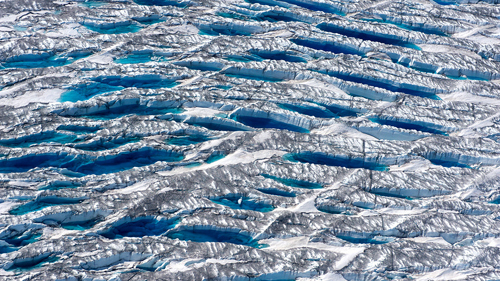 The patterns of ice formation along the perimeters of the ice resemble a chemical spill pattern of dispersion. Why? Chemical ice nucleation elements are being used. 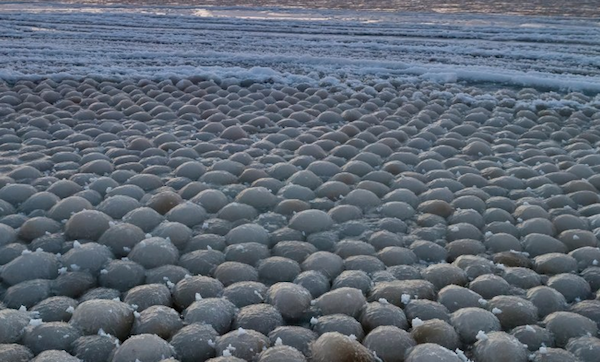 The power of these endothermic reacting materials is nearly beyond comprehension. 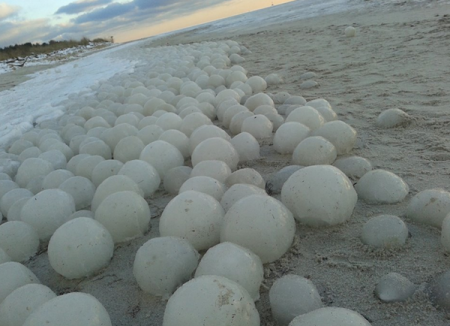 Spherical ice balls forming on 40+ degree waters in Lake Michigan are only one example. Given all the information already covered in this article, are the climate engineers actually helping to cool off the Arctic overall? No. When an artificially/chemically nucleated ice cap is engineered over an already overheated Arctic ocean, the ocean heat is trapped below this artificially enhanced engineered ice cap. 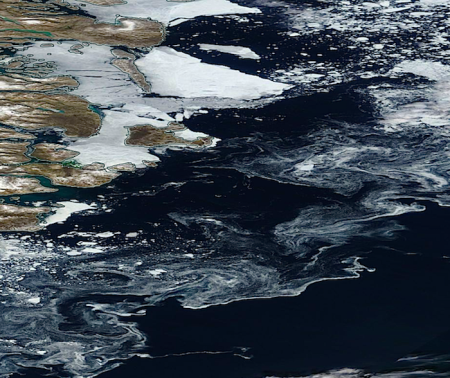 The warmer seas then continue to thaw and thus release even more methane deposits from the sea floor. This process is further fueling feedback loops that are pushing the planet into a runaway climate shift. 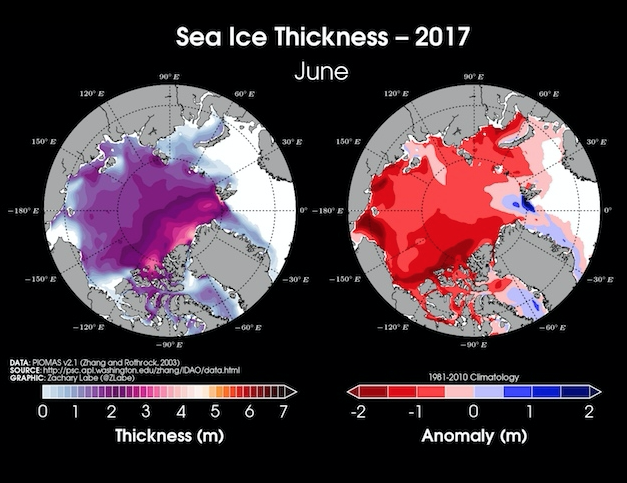 Global sea ice deposits are plummeting to record low levels in both polar regions. 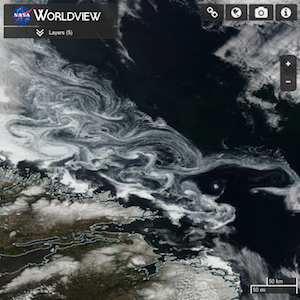 Climate engineering is not mitigating the unfolding abrupt climate shift, it is exacerbating it. 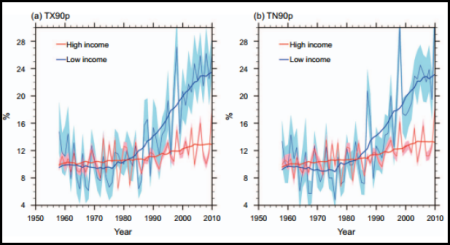 The current rate of biosphere change is so extreme and non-linear that many statistics are going "off the charts". 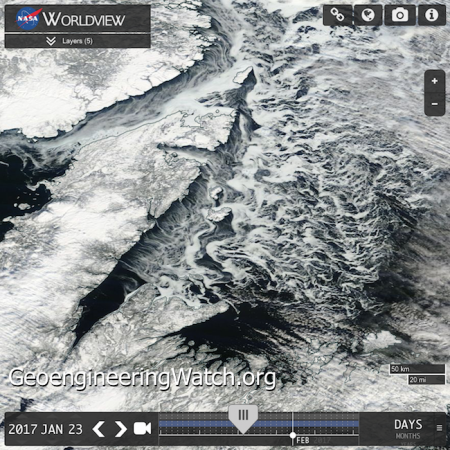 Climate engineering and atmospheric experimentation are greatly contributing to our rapidly disintegrating climate system. Life on Earth is now in completely uncharted territory, all life on our planet is in the balance. Are we powerless to alter the current equation? That answer remains to be seen or known. The final outcome will depend on what we collectively do, or don't do. 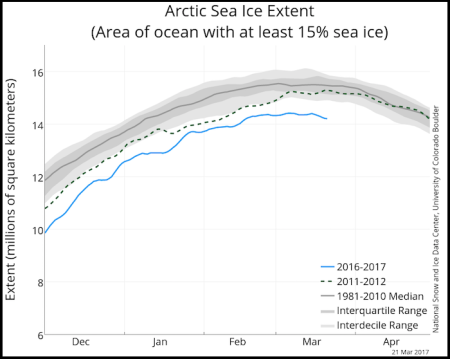 Arctic and Antarctic sea ice cover shrank to a record low in February since measurements began almost four decades ago, the US National Oceanic and Atmospheric Administration said Friday. 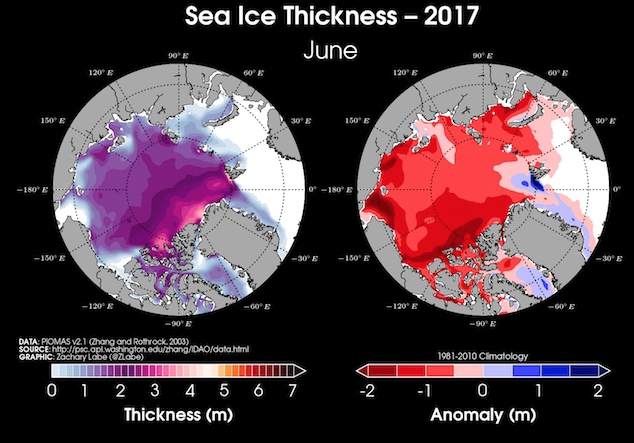 MOSCOW (Sputnik) — The Antarctic sea ice cover has shrunk by almost a quarter, as as the Arctic sea ice cap decreased by almost 8 percent. 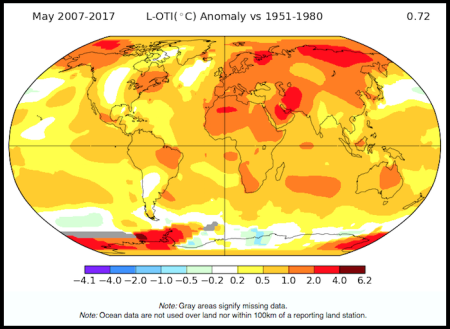 The paper, published today in the journal Science Advances, is the latest effort to piece together current and historical measurements from ships, self-propelled floats, satellites and even seals to get a global picture of how the oceans are faring under rising temperatures. How is it possible that the abrupt climate shift unfolding on our planet is not creating nearly as much heat in wealthy nations as compared to poor countries? This, now statistically proven scenario, is yet another glaring red flag to confirm the ongoing global climate engineering insanity being carried out by militarized / industrialized nations. Highly toxic and environmentally devastating global geoengineering programs are a primary tool and weapon of the more powerful nations. The worldwide weather modification assault has been used to confuse and divide populations in regard to the true state of the climate and the true extent of the threat that we collectively face. 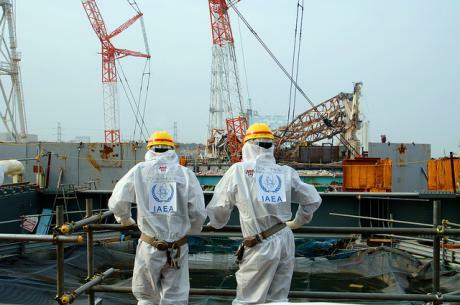 The ongoing effort by the climate engineers to mask the full degree of climate damage from first world populations has been aggressive and consistent. 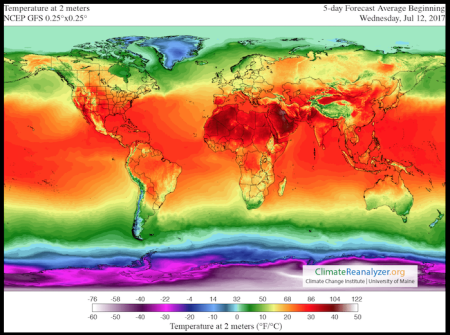 Recent studies have now proven that a completely unnatural global temperature scenario is taking place which would not be possible without the existence of ongoing climate intervention programs. 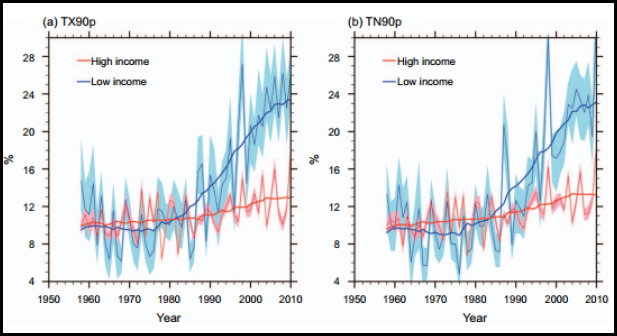 Temperatures in high income nations are rising at a far slower rate than low income nations. 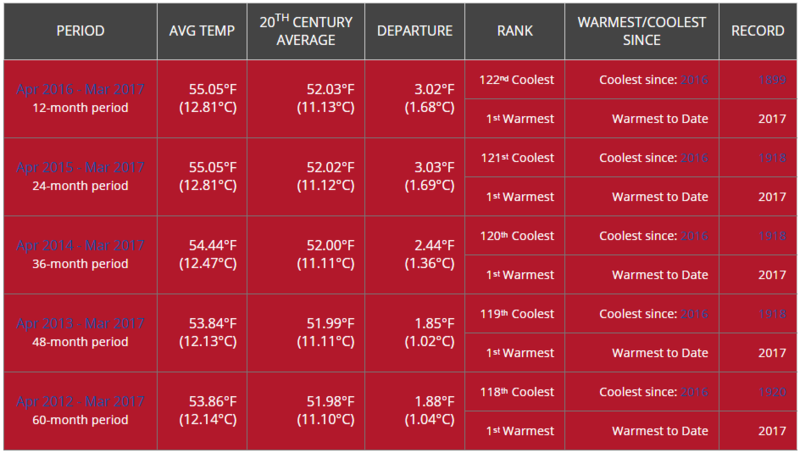 Based on an average of three data reanalyses, the researchers found the percentage of hot days each year in low-income countries rose from a base of 10 per cent – or 37 days – during the 1961-90 base period to 22 per cent – or 80 days – by 2010.By contrast, rich nations had the percentage of hot days rise much slower, from 10 per cent to 15 per cent, or 37 to 55 days. 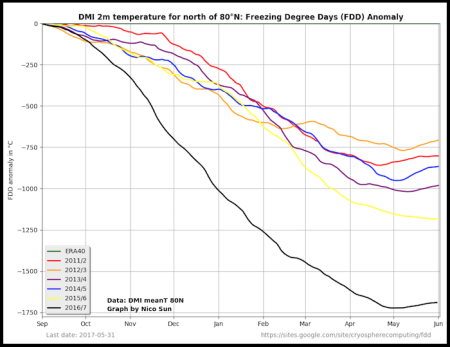 These graphs show an astoundingly unnatural scenario which is virtually impossible without massive climate intervention programs. 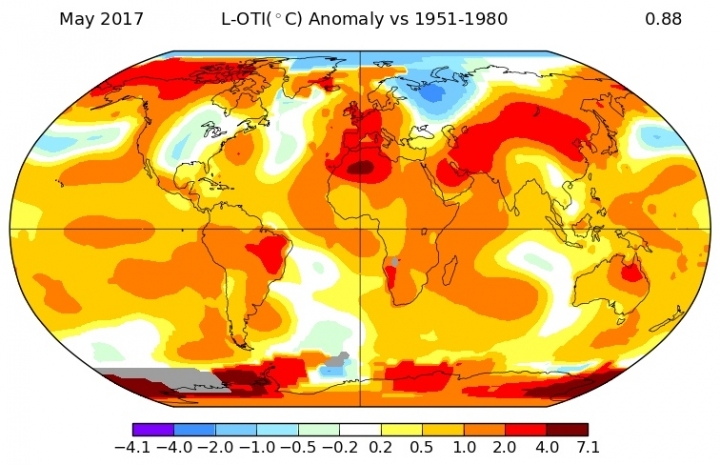 "It's not good for low-income or high-income countries but it's particularly worse for the low-income countries as they are the ones which can least afford to adapt," (Dr. Nicholas Harold from the Climate Change Research Center at the University of New South Whales). Poorer nations typically have far smaller accumulated or annual per-capita greenhouse gas emissions than industrialised ones. 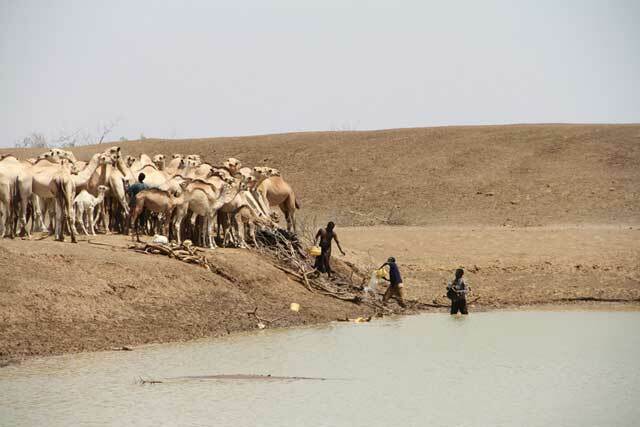 With the uneven warming trends likely to continue, poor nations have a case for demanding rich world assistance to cope with climate change… Poor countries have "contributed the least, but in terms of temperature effects, they will suffer the most". 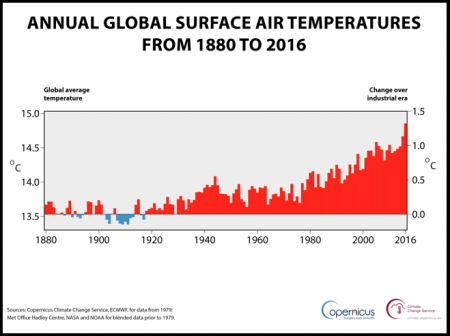 Even within the boundaries of wealthy nations, the climate engineering signature of completely out of balance temperature contrasts are clearly visible. 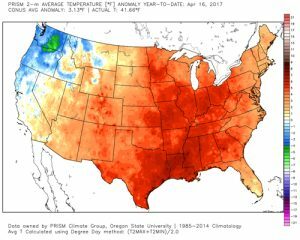 Geoengineered weather whiplash continues to batter the US (and other nations) with historically unprecedented abrupt temperature swings and shockingly stark temperature boundaries. 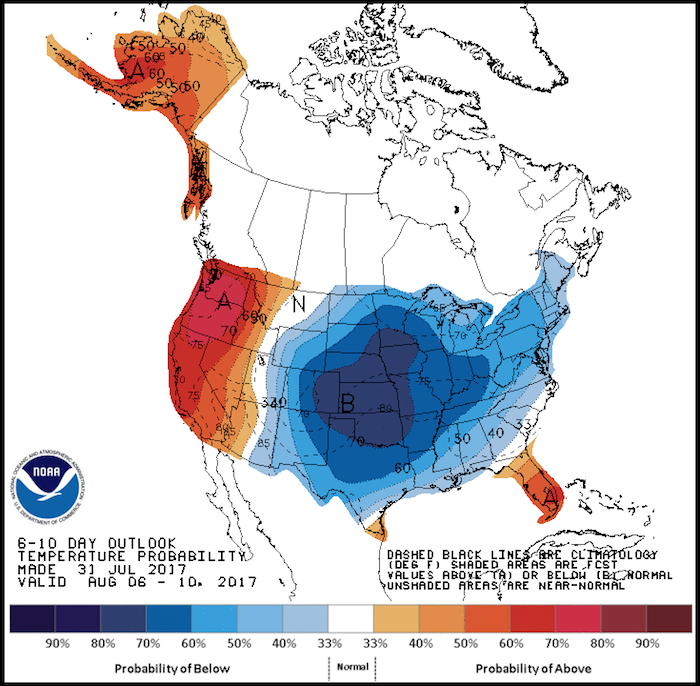 Each color tier in the NOAA long-lead forecast map above (the scheduled weather) represents a temperature departure from normal of 3-4 degrees (blues for below, reds for above). Temperatures 25 or 30 degrees above normal will persist in regions of the southern US while incoming Pacific moisture will continue to be chemically ice nucleated to cool down the Pacific Northwest. Antarctic sea ice extent has been commonly referred to by "global warming is a hoax" disinformation sources as "proof" that the planet is not warming. 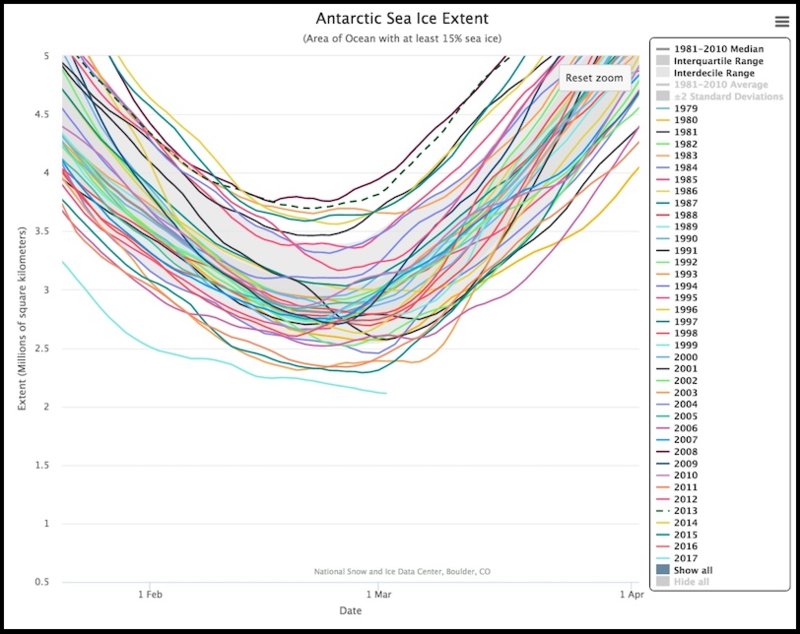 The latest sea ice data from Antarctica is reflected in the graph below. The sea ice at the bottom of the world is at record low levels and still plunging. Geoengineering can and is creating short term highly toxic cool-downs at the cost of an even worse overall warming and an accelerated climate disintagration. The ice levels at both poles is at record low levels. In the graph below a slight statistical decline of global temperatures can be seen after the peak warm year of 1945. This 30 year temperature "hiatus" from 1945 to 1975 perplexed climate scientists that were unaware of the geoengineering / solar radiation management programs that had been deployed just after WWll. 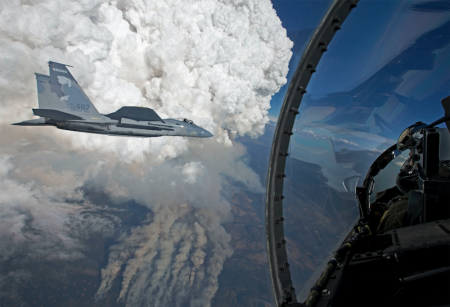 As the countless negative consequences of climate engineering began to manifest in the mid to late 70's (and the greenhouse gas buildup continued), the military industrial complex simply doubled down on the geoengineering insanity. They have been doing so ever since. 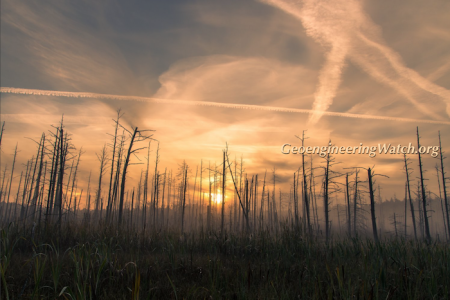 Though there are countless forms of anthropogenic damage to the planet, climate engineering is the single most destructive of all (short of nuclear cataclysm). 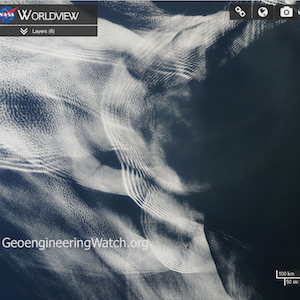 What can we do to expose and halt the global geoengineering assault? Each of us can do a great deal to help with advancing this most critical cause, but we must all take action if we are to have any chance of changing directions. Click HERE for more input on what you can do to help. NSW and Queensland brace for hottest February day on record, putting paramedics on high alert. 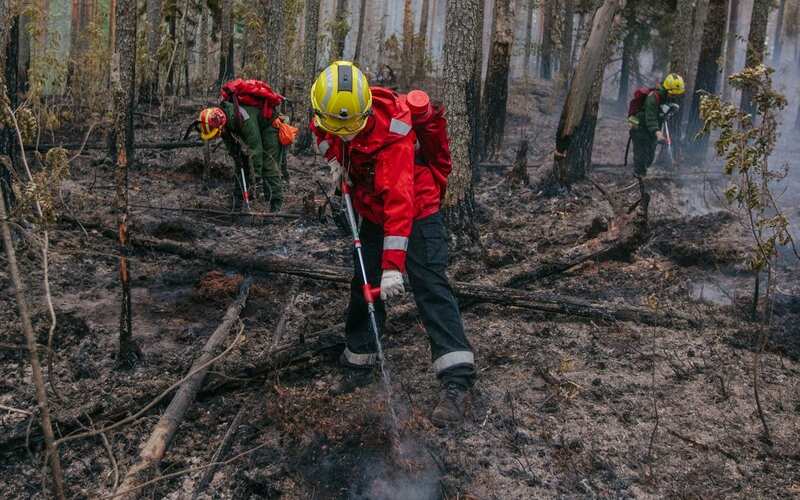 A state-wide total fire ban has been declared for Saturday as the mercury was set to soar past 40C.